Brightening the image also reveals a hidden easter egg. With the dust settling on the 2019 Geneva Motor Show, Tesla is getting ready to unveil its latest new model. On March 14, the Model Y crossover will be revealed to the world in what will be the most important electric car reveal of the year. Ahead of its debut, a new teaser image has emerged online as part of an invitation for the Model Y’s launch event. Unlike previous shadowy teaser images, the Model Y is shown with a blue paint finish and traditional side mirrors. While the teaser isn’t very revealing, it does confirm that the headlights will more closely resemble those of the Model 3 than the larger Model S sedan and Model X SUV. Originally, the Model Y was going to be built on a bespoke platform, but the electric crossover will now ride on the Model 3’s architecture to keep development costs down. Amusingly, a Twitter user also discovered a clever easter egg tucked away in the image. Knowing that people will increase the brightness of the image to reveal more details, Tesla added the words "Nice Try” to the license plate. According to Elon Musk, the Model Y will be around 10 percent larger than the Model 3 sedan and cost about 10 percent more. The Model Y will also share approximately 75 percent of its parts with the Model 3 and will likely be offered with the same powertrain configurations as its sedan sibling. The range-topping Model 3 will accelerate from 0-62 mph in 3.2-seconds, hit a top speed of 162 mph, and deliver a range of up to 310 miles, but the Model Y’s larger size and weight will probably affect its performance and range. 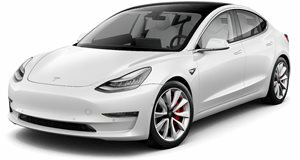 Pricing details are also being kept under wraps for now, so we’ll have to wait and see if there will be a cheaper version like the new entry-level $35,000-Model 3, but higher spec models will likely be available first. Given the strong demand for the Model 3, the Model Y should be another smash hit for Tesla. Potentially, it could outsell its sedan sibling given the current demand for electric crossovers. Production is expected to start in late 2020.